There are lines that the X-Men have sworn never to cross. But after the shocking events of Messiah CompleX, Cyclops realizes that some enemies need to be dealt with permanently - and the X-Men can never know about it! 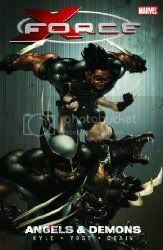 Enter Wolverine, Warpath, X-23, and Wolfsbane - X-Force! Collects X-Force 1-6.